HALLIE: It's True Crime Tuesday, we're talking about the real life of Patricia Highsmith who changed the terrain for crime novelists. I've long been a fan of her dark suspense novels ("Strangers on a Train," "The Talented Mr. Ripley"). Her villainous "hero" Ripley, a sociopath and the ultimate user of other people, has become one of literature's (not just crime fiction's) iconic characters. 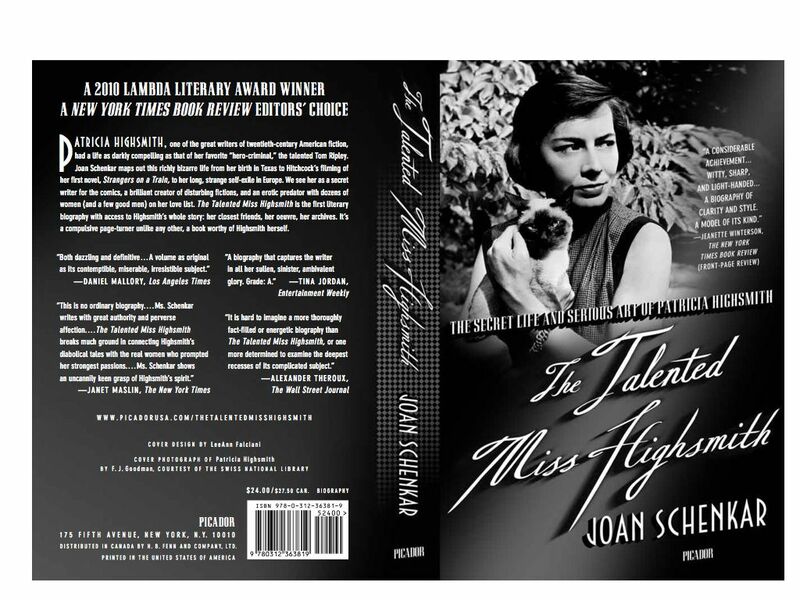 Welcome Joan Schenkar who has written a fascinating biography, "The Talented Miss Highsmith: The Secret Life and the Serious Art of Patricia Highsmith," which I just bought for myself for Christmas and am halfway through. It's on the New York Times's list of 100 Best Books of 2010. Joan, Pat (as you call her) was not a fan of Christmas--you quote her: "Christmas itself is positively the erupting boil of human guilt." Was she really that dark when it came to human sentimentality? JOAN SCHENKAR: The adjective "dark" doesn't begin to cover the shades of Noir that comprise Pat Highsmith's feelings and writings about humans. But it is always the darkness of someone who had high hopes and saw them fail; a darkness full of rage and disappointment and despair. If you read her works carefully -- and she hasn't been read very carefully in America -- and if you've been, as I have , lucky enough to go through her personal journals, you'll find that no American writer has been more motivated by love than Pat has. She died for love a thousand times in her life -- and killed for it over and over again in her novels. Christmas was just an unpleasant detail (she would have hated giving presents, of course), but sentimentality irritated the hell out of her. HALLIE: You say Pat kept "eight thousand pages of notebooks and diaries in five languages." She wrote them and she held onto them despite moving every few years, bequeathing them to posterity. What did it tell you about her that she kept them, and did she tell the truth in them? JOAN SCHENKAR: No writer keeps diaries or journals innocently – they are always both a conversation with herself and a down payment on her posterity -- and Pat kept both diaries and journals all her writing life. Pat's journals show that she was an extraordinarily serious artist. Because her psychology – like the psychological doubling of all her major characters – was so deeply divided, she tried to keep her art in her journals and her life in her diaries. But what I found so interesting is how the diaries and journals leak and seep into each other: how they beg, borrow and steal from each other's materials. She is our most surreptitiously autobiographical writer. The other interesting thing was how extraordinarily candid Pat was in her private notations; she set down things most people would suppress. But because this is Pat Highsmith we're talking about her journals and diaries are also full of misdirections, forged dates, and the kind of lies that light the way to truth. HALLIE: Was it a challenge for you to separate truth from fiction, and how did you do it? JOAN SCHENKAR: Disengaging the tangled skeins of Pat's life was like performing neurosurgery. It was even more like conducting a major crime-scene investigation. Aside from spending more than a year in her immense archives in Switzerland and interviewing nearly 300 people and comparing and counter-balancing their stories, I had to put myself bodily and mentally in every place where she'd lived and left emotional, physical and/or artistic deposits. I walked in her footsteps, thought her thoughts, and, most uncomfortably, entertained some of her feelings. She had the mind of a criminal genius – so, naturally, I stalked her with the mind-set of a Sherlock Holmes. HALLIE: For those of us who write it, Patricia Highsmith changed the terrain of crime fiction by creating the genre of psychological suspense and making her heroes villainous. How do you see the change she wrought, and why was she uniquely able to do it? JOAN SCHENKAR: To answer that I have to come back to Pat's most resplendent virtues as a writer: she went to the ends of her nerves to get the news and made art out of what disturbed her. I consider her to be less a crime novelist than a punishment novelist: she was obsessed with the effects of plotting and committing crime (murder was the crime at the center of her own imaginings) on the human psyche and her work provides us with the most detailed anatomy of guilt in American literature. She knew that she was her own best model of abnormal psychology – and used herself as mercilessly as she used anything. HALLIE: Any clues you can give us about her process as a writer? I know she was a compulsive listmaker--was that part of her process? And how was she so productive with all that drinking, not to mention the Strum und Drang of her personal life? JOAN SCHENKAR: Her process was entirely her own, and its inner, secret, alchemical workings – the ones that transmute life into art -- will always be concealed from us. But her writerly habits – the ones that ensured her enormous production through all the alcohol she consumed and the emotions she burned up -- are absolutely identifiable. She kept her diaries and journals faithfully (forging and reordering when necessary); she organized her inner chaos with meticulous lists; she wrote every day, usually 5- 8 pages and generally at the same hour; she had her special favorite pens and typewriter and notebooks; she did her little drawings and sketches (always with the left hand; she wrote with her right hand); she liked to intermit her writing with physical work like gardening and making furniture. Like all committed writers, Pat understood that the art of writing is supported more by habit than by inspiration. Also, she used her female lovers as Muses –-- but it didn't take long for their presences to irritate her. She could live for love, but not with it. To sum up: Pat Highsmith was a real writer and behaved like one: i.e. she was compulsive, obsessive, fetishistic, and hell- on-wheels to live with. HALLIE: Are there any current writers, in particular, whom you feel are mining the vein that Highsmith opened? 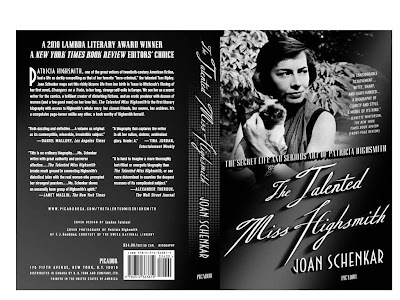 JOAN SCHENKAR: Of course there are many writers who say (or whose publicists or book jackets say) that they have been influenced by Pat Highsmith. And often the influence is clear. But, you know, I'd be doing as much a disservice to their writing as I would be doing to Pat's if I pointed them out here. Comparisons with living writers are always invidious. Writers like Marcel Proust (the world's greatest crime writer, if only critics would cop to it), Edgar Allan Poe, William Burroughs, Djuna Barnes, Graham Greene, Fyodor Dostoyevsky, and J.G. Ballard. With perhaps a soprano accompaniment from the wonderful Muriel Spark, a nice base line from all the great American Classic Comic Book writers, and a little rhythm from the Marquis de Sade and his riding crop. HALLIE: I'm imagining quite the parade. That's some company! In an email to me, you said writing the book nearly killed you... in light of the subject matter, what could be more appropriate? Please, elaborate! JOAN SCHENKAR: Well, murder was Pat's speciality. And I really thought I was going to be her last victim. Writing a biography -- and I say this because in my other life I'm a playwright and create characters -- offers the most intense relationship a writer can have with her subject. You live with this person for years – you know more about them than their lovers or parents or friends ever did, you know more about them than they ever knew about themselves. And you have to be responsible to all the facts while using those facts creatively. It's a relationship of intolerable intimacy and Miss Highsmith – and that's what I called her when we first began to work together – hated self-revelation and loathed cohabitation. And she made her hatred and loathing VERY EVIDENT to me. I had to drag myself to my desk for years. Not to mention the fact that , by conservative estimate, I'm a member of at least four of the groups which she spent the last part of her life reviling. And her fully expressed feelings on these subjects – every word of which I had to read – were deeply upsetting to me. But we worked through it, finally, and actually we're quite matey now. HALLIE: How did it feel to find your book reviewed on the front page of the New York Times Book Review (especially in the wake of the stink some writers have been raising about the Times biased focus on *male* *literary* icons)? JOAN SCHENKAR: I was pleasantly and defensively numb, to be honest. I did think I was doing something new with the form, subject, and style of biography -- not to mention the fact that this is the biography of a woman by a woman, of which far fewer are published than biographies of any other kind -- and so it was wonderful to be recognized by the NY Times, which sets the standard in the United States. But the first thing you learn in show business (and it's also the last) is that if you believe your good reviews, you have to believe your bad ones. And so, really, I just believed myself. Joan will be checking in today so if you want to comment or ask a question, please do join us! Ooh, and I forgot to mention - the book comes out in January in paperback. What a terrific interview today! I loved Patricia Highsmith's books but knew nothing of her as person. I will certainly look for Joan Schenkar's book. Delighted to be a guest today on Jungle Red, among writers and readers with the taste and talent for the Other Side of American fiction. P.S. Thanks, Bobbie. If you love Highsmith's work, her life will fascinate you. The life MADE the work -- and it's like no one else's. Fascinating, fascinating, Joan. Now I'm eagerly awaiting that paperback edition. I have a question for Joan ... .
Because writing a person's biography is such an intense and even intimate commitment, how do you choose who to research and to write? Thank you so much for this interview. I've read the Ripley novels and her non-fiction about plotting, but like others said, know very little about her personal life. I look forward to reading this biography--this interview has certainly intrigued me! Hank -- a pleasure to hear your electronic voice. You were the BEST panel chair ever (at the Edgar Allan Poe Awards) not to mention being the best-dressed. You know yourself there's no rest for writers. The only thing worse than writing is NOT writing. Though, frankly, I'd love to be NOT writing in some over-priced tropical spa about now. The paperback, btw, is out on Jan. 4. Thanks for your comment, Ramona. Highsmith hid her life in plain sight in her fictions -- so I think you'll find the biography interesting. And apologies to you Bobbi for adding that extra "e" to your name. My typing has made my spelling even worse than it usually is! And yes, you are SO right. "I'm finished"--is instantly followed by--"I'm doomed." Looks like a GREAT book. Thank for sharing, Hallie. My favorite book of PH's is Plotting and Writing Suspense Fiction. I didn't know she was a kindred spirit. "Christmas was just an unpleasant detail (she would have hated giving presents, of course), but sentimentality irritated the hell out of her." LOVE IT!! You s paint a fascinating portrait of Pat Highsmith -- even in such short forum as a blog. (The interview read like a suspense novel with new, bizarre revelations staged in beats, I can just imagine what the book is like) You can definitely tell you lived and breathed her. I love the lin: the kind of lies that lead the way to truth and would love to know more about how you mean that? I am reading nothing but non-fiction these days, so this book goes immediately on my list. I have to purchase this biography. It sounds as fascinating as a mystery novel. Usually, I tend to ignore parallels between an author's life and work because they seem at best speculative. But this writer seems to have lived intensely in her mind what she wrote. Joan and Hallie--congratulations that was a brilliant interview. I was especially interested to read the element of loathing that developed in your relationship with Miss Highsmith. I don't know if I could work of a long time on a subject I didn't actually love, so I'm impressed. Thanks for weighing in, Doug. I read your interesting blog post on the topic. I'm not a big reader of biographies, either -- and yet I found the story of Patricia Highsmith endlessly fascinating. PJ -- Highsmith is a misanthropist's delight. I think you'll be interested to see just how autobiographical that little book she wrote about plotting and writing suspense fiction really is. Jan-- So glad you like the phrase because it's the way Highsmith approached her diairies and notebooks: creating little fictional scenes that embodied her own emotions. And it's also the way I approached her life. I tried to find new fictional techniques ("lies", if you will) to enter her character in ways as unconventional as she is. Thank you, Rys, I didn't know I could work for such a long time with someone who disturbed me so completely either -- but my admiration for her work kept drawing me back to the desk. Not to mention the fact that I love a good artistic challenge -- and this was one was definitely inter-galactic. Thank you, Mr. Levin, for the compliment. What do you suppose Highsmith would think of all the high-tech stuff expected of authors these days - platforms, podcasts and Facebook? ;) Sneer City, no doubt. Joan, wonderful interview! I kept nodding my head in agreement as you talk about the intensity of writing about another and the intimacy of it. I don't know that I could have written about a subject like Highsmith. I find that I'm drawn to eccentric, larger-than-life people to write about -- not sure what that says about me! Best of luck and I look forward to the paperback release!